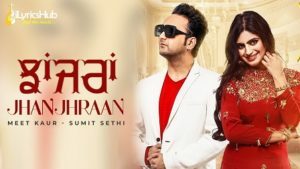 Jhanjhraan Lyrics Sung by “Meet Kaur” featuring “Ankit Gera” & “Noddy Singh“. The Music of the New Punjabi song is given by “Sumit Sethi” while lyrics are penned down by Noddy Singh. Sumit Sethi On The Beat…!